This increase reflects the success of the government’s reforms to rebalance the economy and help more people into work. 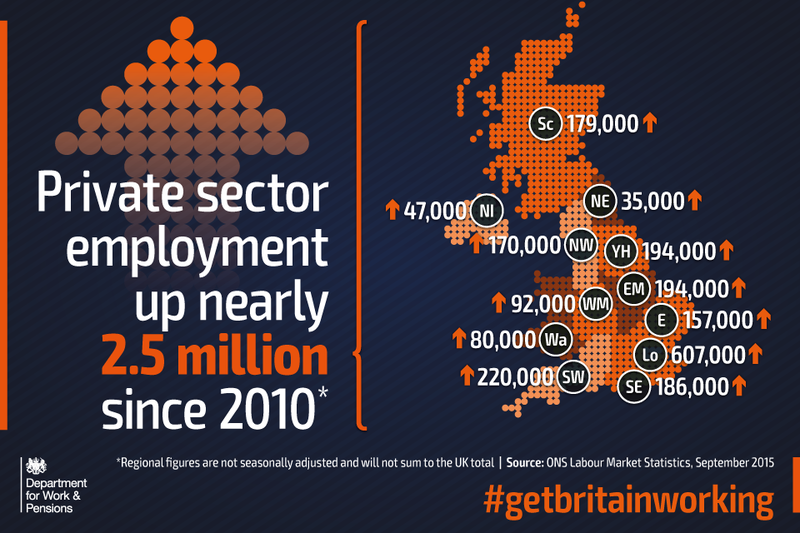 In further signs of the strengthening UK jobs market, there are nearly three-quarters of a million vacancies in the economy at any one time and almost 90% of the rise in employment over the last year is from full-time work. Real pay (excluding bonuses) has risen by 2.9% on average – the fastest annual rise since 2002 – meaning hardworking people have more money in their pockets. As part of our one nation government, we want everyone to succeed and achieve their full potential, and through our reforms we are doing just that. With a record number of people working in the private sector and wages rising, it is clear that the remarkable jobs success that we have seen under this government is continuing. With wages continuing to rise and over 450,000 more people in private sector jobs than this time last year, this one nation government is delivering on the commitment to ensure the economic recovery is felt by all sections of society. Unemployment has fallen by almost 200,000 in the last year, as the number of people looking for work for longer than a year has fallen to its lowest level in 6 years. Youth unemployment has continued to fall, and is down by 215,000 since 2010, while the number of economically inactive people fell by 65,000 in the last year, as more people look for work or are in work. Female employment is at a record number, 14.55 million, and a record employment rate at 68.8%. Employment rose nearly 190,000 in the past year.